Nature by H.D Carberry | Welcome all English teachers around Malaysia!! Hugh Doston (“Dossie”) Carberry was born July 12, 1921, the son of sir John Carberry, a former Chief Justice of Jamaica, and Lady Georgina Carberry, in Montreal, Canada. He came to Jamaica in infancy and spent most of his life there. He had his primary education at Decarteret school in Mandeville, Jamaica and then attended Jamaica College. After working with the Civil Service, to which he qualified as second out of over 100 applicants, Carberry went to St. Catherrine College, Oxford University, where he obtained his B. A. and B. C. L.. He read Law at Middle Temple and was called to the Bar in 1951, then returning to Jamaica to engage in private practice. In 1954, Carberry married Dorothea, and they had two sons, Martin and John, and a daughter, Christine. In addition to his career in law, Carberry was a poet and gave outstanding service in the cultural field, being a member of the Managing Committee of the Little Theatre since 1951. A devout Christian, he was also a pillar of the Providence Methodist church as Class Co-leader. Carberry was Clerk to the Houses of Parliament from 1969-1978 and a member of the commonwealth Parliamentary Association. He was appointed Judge of the Jamaican court of appeal in 1978 and served for a decade. H. D. Carberry died on June 28, 1989. And trees struggling in the high Jamaica winds. And the reaped canefields lie bare and fallow to the sun. And beauty comes suddenly and the rains have gone. The poem tells of the weather conditions in Jamaica although it does not have the four seasons of spring, summer, autumn and winter. The weather conditions of golden sunny days and wet rainy days are just as good and are almost equivalent to the four seasons. The poet tells about his homeland , Jamaica and rejoices the beauty of this island. Jamaica has no seasonal changes. It has a tropical climate which is hot and wet throughout the year. The days of golden sunshine are glorious and magnificent. The are many canefields in Jamaica as sugar is one of the main exports in this country. In the ending of the poem, the poet tells us his favourite time – days when the flowers of mango trees and logwood blossom. He uses imagery of sound and smell to illustrate abundant life and activity in the bushes when the ‘sound of bees and the scent of honey’ add to the charm and beauty if Jamaica. He describes the fields filled with lovely yellow buttercups. All this happens when the rains have stopped and the beauty if nature emerges once again. We should not long for what we do not have. We should appreciate our homeland. We should appreciate the beauty of nature. For reference, I’ve included the pictures of some plants (plantation) mentioned in this poem. This is a sample of the flower, buttercup. This is the guango tree. we all know…the analysis is great…….. I just found out that I am related to him distantly. His side of the familly moved to America, were as mine live in Canada, Jamaica, and the Uk. It great to see what his side of the family managed to accomplish. I will definity be purchasing his books to see more of his work. It is midnight and just came from work. I am in Jamaica where i live and was just reflecting on school days. I heard the rain and lightening from a thunder storm which is now going on outside. My mind then reflect on NATURE by HD CARBERRY. i haven’t heard it from i left primary school in 1980. That poem was in our school book and was always recited in grade 5 when i was 10. Great job to those that put it on line. Thanks on behalf of my classmates that were in primary school in Jamaica in 1978 at age 10. i can hear the big dramatic MAGNIFICENTLY, by everyone. Tremendous memories. Again, thanks. I had the pleasure of not only knowing Dossie Carberry, but also his parents many many years ago in Jamaica when my Dad, their friend took me on numerous vists to their home on East King`s House Rd. Justice Carberry and Lady Carberry came from Grenada to Jamaica after attending college in either Canada or the UK or both. I knew Dossie Carberry (I always called him “sir”). When I worked at the Gleaner he regularly picked me up when I waited at the bus stop at Marescaux Road (across from Mico College) and dropped me off at work. A courtesy to a fellow poet. Orait Gee…The form 4 poems are In the Midst of Hardship and He Had Such Quiet Eyes while the short stories are QWERTYUIOP and The Fruitcake Special. For the Form 5, they are going to use the poems Are You Still Playing Your Flute and Nature. Gulp and Gasp is also in the Form 5 syllabus. I studied this poem as a child and loved it. I could not remember all of it though and became obsessed with remembering it. I was thrilled to find it here on line and now its in my collection of favourite peoms which I love to read over and over again. He is simply brilliant. Thanks! Great effort! God bless you! Hope the presentation went well Munibah! Welcome welcome and welcome Rabiatul! who are the character in this poem?? my teacher ask we find the characters..
It’s the 3rd person point of view. This poem is very good….. i can learn The important of nature and its beauty!!! but i need more about this poem cuz my teacher gave a task entitled “what is the poem (NATURE) about ? Canefield = a sugar cane plantation (ladang tebu). guago trees = a hybrid tree which is a cross between guava & mango. to me it is very thoughtful and interesting. and thanks for the futher information. it helps me a lots. such a very useful info for me…TQ. thanks! it helps me a lots..
whoaa yhis poem touched my feeling very much! got this page while surfing for the materials relating to the poem..great! thanks a lot. ; will definitely come back here for more..
how does poet fell about his country? The poet is full of pride and admiration for his beautiful country, Jamaica. I thank you on the behalf of the lost-in-english form 5 population but the language and styles you gave out wasn’t really helpful. The poet uses free verse in this poem. There is no rhyming scheme and the style is easy and informal. He describes the changes in weather in simple language. Therefore, it is easily understood. We can appreciate the unpredictable weather as it is sometimes full of sunshine and sometimes it is struck by the storm. This poem vividly describes how tree struggles to stay rooted and of tall grasses gently dancing with the fair breeze. thx……….tis saved my life……….2moro is the exam…………..
my teacher as me 2 find what is point of view…i don’t know how 2 find it and what it is actually…can you help me??? Point of view is defined as the angle from which the story is told. thanks.. it really help me.. This poem is written by H.D Carberry not me. Awesome blog ;D Loveeee this poem. I was about to study this piece with my trainee teachers (major Islamic Studies) when i found your blog. (at least there are pictures to show during my lecture) A life saver. its really useful..thanks a lott~!! I am dorothy.Iwas born in jamaica. as a child ,I was made to study this poem. well m a nature lover… those wrds tat used in the poem to describe the beauty of nature… really awesome… touches my core heart…..
wow….. thankz it really helped me 4 ma SPM trialz…!!! This poem allows me to reflect on the beauty of the land of my birth -Jamaica. I can vividly remember reciting this poem “Nature” in promary school and would imagine the rain , winds , yellow flowers between the grass.I enjoyed reading the bio on Mr Carberry and look forward in purchasing his book.Thak you for sharing this poem. Just want to know if u have anything on nxt years’s f3 lit. text The railway children as it can help me to get prepared. do you have the example question of this novel? may i use this as reference for my assignment? Thanks in advance! My wife asked me if i remember this poem. Bring back so much memories of my days @ Primary school. only one point of view in poems nature? Helps me a lot with my studies !! thank you sooo much. All the information are great and full. I’ve never mentioned it as a hybrid. what type of poem is it? This poem is near and dear to me, I learned it as a child in middle school and now I can teach it to my children. Thank you H.D Carberry. how can i teach this poem in a creative way especially to the weak students. hi thanks the poem was really interesting at the very point doh i don’t live in that beautiful jamaica place as it is described in the poem. I like this poem. I remember growing up in Jamaica and learning this poem at school. It came to my mind the other day and I thought to look it up on the net. It brings back so much memory of JA. That is quite a tough decision to make :P..you are most welcome! TQ for throwing the idea 🙂 Indeed, it is another onomatopeia. This poem is great! Thanks for publishing it online now I can understand the poem better and have a glimpse of what Jamaica is like. Thanks for your effort. It makes my teaching easier now. A Fantastic Post you have. I’m visiting it very often. Thanks. one of the best poemabout Jamaica. I can still see myself standing up proudly in front of my class and reciting this poem. #truememoriesneverdie. this page helped me alot 🙂 thank you! I read this paragraph completely concerning the difference of hottest and preceding technologies, it’s amazing article. I have been trying to obtain a photograph and Bio of his father Sir John Carberry. I worked for him at the Law Revision Committee where he and Sir Colin MacGregor revised the laws of Jamaica in the 70’s. How can I obtain this information. I am putting a scrap book together for both. They were wonderful and knowledgeable to work for. Do you know of any other poems by hd carberry? Wow…..this poem I love,it reminds me of primary school….I didn’t remember it all but now I’m studing the words,thank u!!!!! what does the ‘buttercups have paved the earth with yellow stars’ mean? And why are the reaped canefields lie bare fallow to the sun? The buttercups are yellow in colour. So, when the buttercups bloom, they look like yellow star covering the earth. The reaped canefields are left to fallow because they are to dry so it is easy to get rid of them. I like the language used to describe the poem: simple and of my students’ level. Hi, thank you so much for the notes. They are a great help for me in my teaching. However, if I may ask, why is this poem in the 3rd Person POV when lines 1 and 3 has ‘We’ in them? Is it because the persona is talking about the nature around him as opposed to his own personal feelings? what is poetic device use in ‘like bullets and the roof “? 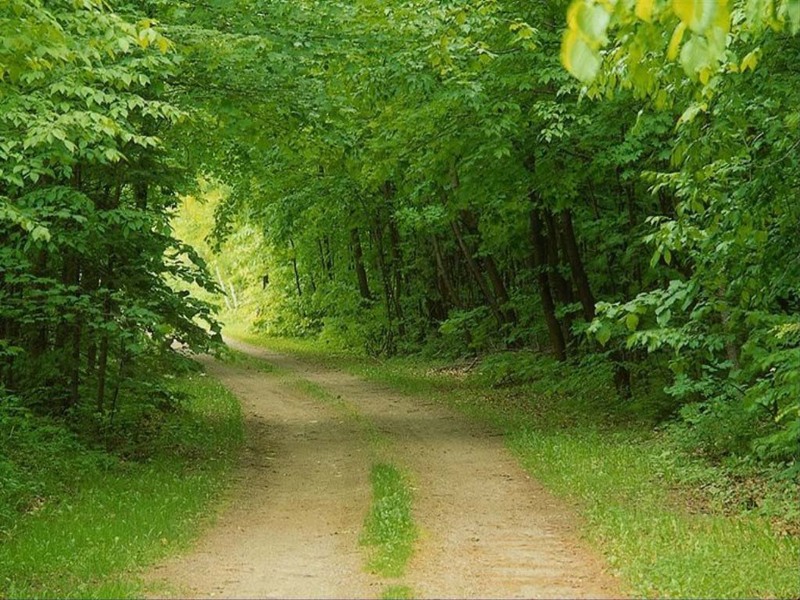 Would it be OK with you if I used the photo, path through green trees, on my meditation website? Hope so…. thanks for the note. it was nice and easy to understand it. good job ! I learnt this poem in primary school and just this morning I was passing some logwood trees in bloom and I remembered the poem. So I came in search of it because I could not remember the line that spoke about the logwood blossoms. Thanks for the sense of nostalgia. Very nice ! Thanks ! Helps me a lot with my studies !! Thank you ..
TQ. I seek to use the materials in your web page for the benefits of my students. May Allah bless you. what is the slightest breath of air? is this phrase approprieately used? It means it is not rough wind.